Kaboccha, a Japanese winter pumpkin (squash), is a staple in Japanese cuisine. 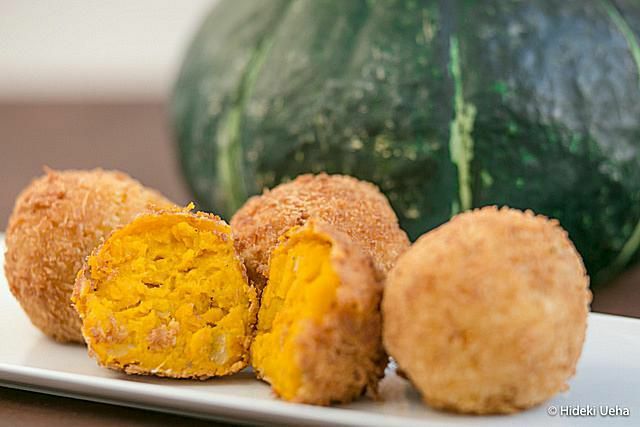 It appears in many different dishes, but a favorite way to enjoy kaboccha is as a croquette, which in Japanese is called a korokke. Traditional Japanese korokke is made with potatoes and is often mixed with ingredients such as ground beef, onions, corn, or other vegetables, or curry seasoning. Kaboccha korokke is made entirely of kaboccha and, in the case of this recipe, yellow onions. It is seasoned simply with salt and pepper yet is bursting with flavor. The korokke are breaded in panko crumbs and then fried. They can be enjoyed as is or dipped in a simple tonkatsu-style sauce. Preheat oven to 400 F. Line a baking sheet with aluminum foil and spray with canola cooking spray. Wash kabocha, cut in half, remove seeds, and cut into wedges. Lay kabocha wedges on the prepared baking sheet, lightly drizzle with olive oil, and gently season with salt and pepper. Bake for 45 minutes or until tender. Allow kabocha to cool. Meanwhile, finely dice the onion. Heat the butter in a skillet and sauté the onion until browned. Set aside. Once the kabocha has cooled, gently scoop out the flesh of the squash into a bowl. Discard the rind. Add the sautéed onions to the bowl and mash together with kabocha using a potato masher. Add 1 tablespoon of milk and gently incorporate. Place kabocha mixture in the refrigerator to cool completely. Roll cooled kabocha mixture into balls the size of walnuts and put on a plate. Place flour in one small deep dish and season with a dash of salt and pepper. Combine the egg and about 1 tablespoon milk in a second small deep dish, and the panko breadcrumbs in a third deep dish. Dip the kabocha balls in flour, next in the egg wash mixture, and then coat with panko breadcrumbs. Place on a plate. Heat canola oil in a medium pan to a temperature of 375 F.
Fry about 6 kabocha korokke at a time, 1 to 2 minutes on each side until golden brown. Remove kabocha korokke to a plate lined with paper towels to cool. Serve with dipping sauce, if desired. When rolling the kabocha korokke into balls, working with cold kabocha mixture is slightly easier than working while the mashed squash is warm. The mixture will still be very soft and a little challenging to shape into a ball, but it is definitely better than working with warm squash. When deep-frying food, it's important that the oil temperature is just right. If you don't have a deep-fry thermometer, toss in a piece of panko breadcrumb—if it quickly sizzles and floats to the top, your oil is ready. Once the korroke are fried, make sure to place on a paper towel-lined plate; cooling on a wire rack won't work as these korokke are soft. A common dipping sauce for the kabocha korokke is a combination of equal parts bottled okonomiyaki sauce or tonkatsu sauce and ketchup. Okonomiyaki sauce is slightly sweeter than tonkatsu sauce, but the two can be used interchangeably for this recipe depending on what you have in stock or your preference in taste. Alternatively, you can simply drizzle tonkatsu sauce over the kabocha korokke, or you can eat them plain without any sauce at all; they taste perfect on their own.